Brett Miller will join us to speak about the Wounded Warriors Project® (WWP). Brett will speak to us about the programs, development, and history of WWP and their vision to foster the most successful, well-adjusted generation of wounded service members in our nation’s history. This is a wonderful opportunity to continue our experiences with our brothers and sisters who continue to focus on the care and readjustment of our soldiers when they come home! Click here to read Brett’s bio. This limited-edition, nickel-plated ornament is a symbol of the strength of your commitment to our nation’s heroes and their commitment to us and our nation’s defense. In just a short time, the holiday season will be upon us. It is a truly special time of year, when we pause to reflect on the importance of family. At Wounded Warrior Project® (WWP), we consider every wounded hero and the patriotic Americans who support them — like you — to be a part of our family. 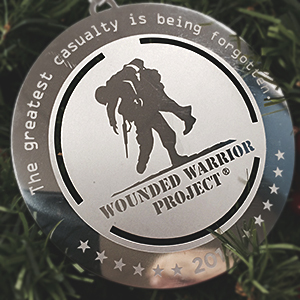 To recognize the bonds we share, I will send you this limited-edition WWP holiday ornament with your gift of $50, $75, $100 or more today. The ornament is etched with our logo, which features two warriors — one carrying the other to safety. The logo is symbolic of the way you carry warriors through their recoveries. With your generosity, WWP will be able to provide programs and services that help injured service members when they need it most — in mind, body, and spirit — helping them to heal from both the visible and unseen wounds of war. Please let our injured service members know, like family, you will remain by their sides as they recover from devastating injuries. Live the Logo™ this holiday season by supporting returning warriors when they need you most. And thank you for being a loyal member of our family. ** Ornaments will be provided while supplies last when you donate through the links above. ** Please allow three to four weeks to receive the ornament.